GLOUCESTER, Massachusetts, August 8, 2013 (ENS) – So many dead bottlenose dolphins are washing up on the Mid-Atlantic coast from New York to Maryland that federal government scientists have declared an “unusual mortality event” and are investigating what is responsible for these deaths. All ages of bottlenose dolphins are involved and strandings range from a few live animals to mostly dead animals with many very decomposed, say scientists with the Northeast Regional Office of the National Oceanic and Atmospheric Administration’s Fisheries Service. The strandings started at the beginning of July, and have accelerated in the past two weeks, said NOAA scientists in a teleconference Thursday. Teri Rowles, National Marine Mammal Stranding Coordinator with NOAA Fisheries said 124 dolphins stranded in July, more than seven times the average number for this period. At least 35 additional strandings occurred in the month of August. The highest numbers of dolphin strandings have happened on the beaches of New York, New Jersey, Delaware, Maryland and Virginia, the scientists said. There are no unifying gross necropsy findings although several dolphins have been found with lesions on their lungs. Although the cause of these deaths is not yet known, the primary suspect is morbillivirus, an infectious pathogen, Rowles said. Many of the animals are too decomposed to offer much information. Samples from several fresher animals have been collected and will be analyzed, but it could be weeks before test results are available. One dead dolphin, in New Jersey, has tested positive for morbillivirus, a naturally occurring virus in dolphin populations that in 1987 was linked to the deaths of 90 dolphins off New Jersey, state officials say. “We are offering whatever assistance we can, including the use of our conservation officers and our boats to recover dolphins as we work to understand the cause of these deaths,” said Mark Chicketano, who heads the New Jersey Division of Fish and Wildlife Law Enforcement. The Virginia Aquarium & Marine Science Center has responded to the high number of dead and dying bottlenose dolphins on the shores of the Chesapeake Bay. The Stranding Response Team is working with the NOAA Fisheries to investigate the cause. Aquarium officials say the Stranding Response Team picks up an average of 99 marine mammals during a calendar year – 64 of them bottlenose dolphins. To date this year they have responded to 82 dolphins, with 44 in July alone. 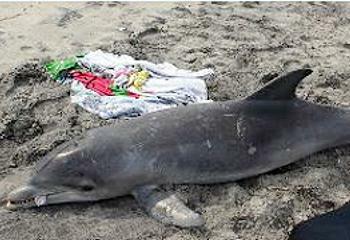 The average number of dolphin strandings for July is seven. Robert Schoelkopf, director of the Marine Mammal Stranding Center, says he believes disease is the culprit in this die-off as it has been in the past. The dolphins that have been affected live in inshore waters, NOAA Fisheries research biologist Lance Garrison told reporters. Dolphins that stay offshore in water more than 50 meters deep appear not to have been affected, he said. The Aquarium’s Stranding Response staff are working to collect the dead dolphins from populated beaches as quickly as possible, but warn the public, as with any dead wild animal, do not touch. Scientists from all agencies emphasize that citizens should not approach a dolphin if they see one lying on the beach, because the animal could have an infectious disease. They should not allow their pets to approach the marine mammal or try to return a dolphin to the water. To report a live or dead stranded dolphin in the Northeast United States, people can call the local marine mammal stranding network at 1-866-755-6622.